Speed is one thing and endurance is another. I've made progress on my pacing over the past week, but that was with distances ranging from 3.1 to 3.4 miles. Doubling that distance reveals opportunities for improvement. This morning's workout confirmed my need to focus on base mileage. The good news is that I'm not as far off from my target as I thought. Bethpage at 7:30 AM is usually a quiet place, but when I arrived, the parking lot was 3/4 full. Judging from the streams of people with stadium chairs and kids walking with soccer balls, I assumed there was a tournament or clinic happening at the athletic fields. It didn't look like they were charging for parking, so I was lucky to get there before the whole lot filled up. According to News 12 Long Island, the temperature was 64 degrees and, at that hour, the bike trail was mostly in shadow. I wore my new Virratas for the first time on pavement (yesterday's run was on the track), and they felt very good. I had none of the problems I'd experienced with the Kinvara 3's (when new) during my half marathon training. Then again, those issues could have been with my feet, not with the shoes. My first half mile was a little rough, and I wondered if I was pushing myself too much following three consecutive hard workouts. I decided to ignore the discomfort because the transition from anaerobic to aerobic breathing is sometimes difficult. Once I hit the first mile, I knew I would be able to manage the planned distance. 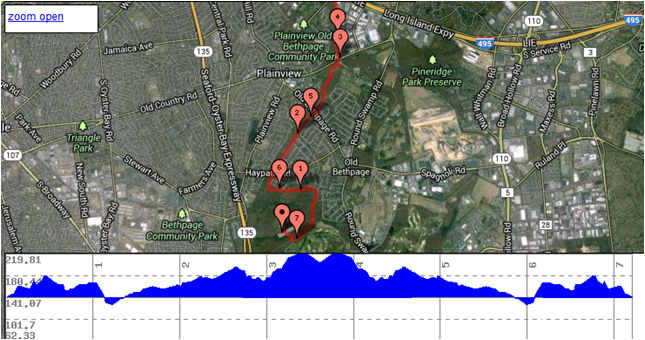 Bethpage's bike trail is rolling, and the north trail is predominantly uphill, all the way to the end. Me and my friend KWL ran it all the way to Woodbury a couple of months ago, and that was brutal. Today, I viewed the hills differently, because I knew all the elevation I was experiencing on the way up would come back as downhills on my return. Yet there were times when the trail seemed to run uphill in both directions. While that was true, I had few troubles along the route. My plan was to run as far as Washington Ave, turn around and come back, a distance of about 7.25 miles. I had the path more or less to myself on the way north, except there were some reckless riders zooming along without helmets. That's a dangerous decision when you're exceeding 20 MPH on downhills. By the time I changed direction for the return leg, there were numerous other runners, walkers and even more cyclists. At around the five mile point, where the path is only wide enough for three people, I saw a man and two women running in my direction. They were running three across. As they came closer, I decided we had a math problem. I kept expecting the woman on the left (who was lined up with me) to drop back or move up to her right. But fifteen feet away, they were still spread out across the trail. I moved as far to the right as I could go without spilling onto the shoulder, so I stood my ground. The woman tried to squeeze by, but she miscalculated the space and her arm caught the point of my elbow. I have very hard bones so I'm sure that hurt, although I didn't feel a thing except contact. It was too bad that we'd bumped, but she saw me coming for at least 30 seconds. 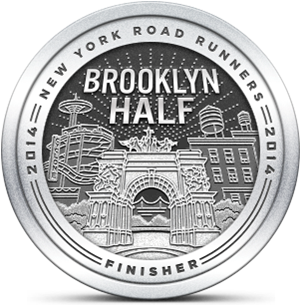 The remainder of the run was contact-free and I felt like I was moving well throughout every section. 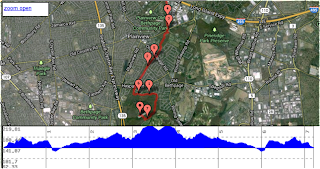 I focused on shorter strides on the two final hills, and tried to maintain my normal cadence. In the end, It was my longest run of the year. I barely squeaked in under 10 min/mile but this run wasn't done for performance. This week has been about speed, distance and a few hills. I'll need to keep it up this coming week. After all, you're only as good as your last run. Why does that piss me off that she couldn't drop behind her running partners? Otherwise - I think that's an excellent run you did. ESPECIALLY since it was the longest you went this year. I smell a CH PR. These three-across runners appeared to be competitive types who I'm sure expected me to move to the grass in deference to their awesomeness. Bad assumption on their part. I had a similar incident on the old trail a couple of years ago, with two side-by-side cyclists. My elbow caught the inside rider's arm very hard. I think I wrote in that post that I apologized by yelling, "Share the road!" I'm not sure about a Cow Harbor PR. My goal is to do no worse than my predicted time (which may actually result in a PR). Yes you do have hard bones and sharp elbows, as I remember from the "friendly" sparring of our younger days. Most people along the path are respectful, but there will always be the self centered fools. Good luck next week with the boys starting school. I'll be in touch soon to catch up. I'm glad I'm not the only one who had a rush of indignation. Not sure what exactly I would have done in real life...maybe yelled "On your left!" Really loudly as she passed. More likely I would have stopped, planted myself and gleefully waited for the resulting collision. A shame it was a girl, sounds like a hip or shoulder check might have been in order. I didn't intentionally bump into this woman. She took a risk and, instead of yielding, paid the price. I felt badly, but perhaps she learned a lesson about sharing the path. Thanks, I will be attempting a 5k in late October . I'll need to consult for prep! Tell me more. Is it a local race? I would welcome the opportunity to be your trainer! Yes it's the essex Halloween haunt. I don't know if I'll break any speed records, but finishing would be an accomplishment. I'll send you some actual strategies for training and racing. You'll do great and finish fine. Guaranteed.